Voice Text App iPhone/iPod Touch | Voice Text SMS Messaging | Free Pc to Phone Calls, Free Voip Calls to India International ! It is not in the law to talk or send SMS while driving and definitely it is not safe as well. It is not advisable to send sms or call when you are driving. What you require is a app in your mobile which can automatically send text sms on your voice instructions. It is like, you tell your phone to send "I'll be reaching home in 10 mins" sms to your wife and it send the sms. That's it. This new thing is Voice Text SMS Messaging service. Today we will look at one such voice text app for iPhone or iPod Touch : Voice Text Pro. According to them, they are the first and only such voice activated SMS / Text messaging app on the App Store. Before we go in details about this app, Voice text app comes with many "pre-loaded" messages but you can create new unlimited custom messages by hitting the + sign or edit/delete existing ones. Nothing is off limit. Voice Text Pro does not use any server, the entire app runs all on the device. That means on 3G, EDGE, or Wifi you always get consistently fast voice texting and all message and contact data is also secured. Voice Text Pro sends text messages free using carrier Email-SMS gateways. Messages are sent via email but are received as text messages. The receiver can reply via text (message will be received as email) or use voice text pro to send a message FREE in reply. You'll need to do a one-time assignment of carrier to the contact. Most US carriers are supported. Hands Free Operation : uses a 100% hands free voice interface. No buttons, just talking. 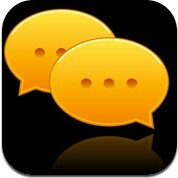 Send unlimited text messages : It uses internet to send SMS. Voice Text Pro don't charge subscriptions or anything, once you buy the app you get free texting for LIFE! Create new custom messages or edit. Combine multiple messages using "Say More" feature. Edit carrier of contact - auto save. Browse and edit pronunciation of contact. How to use Voice Text Pro to send voice text sms. Text will auto-load, just hit send! To download the app, visit Voice Text Pro in appstore. The cost of Voice Text Pro : $4.99 ! !